84 MW New Bong Escape Hydropower Project (the 'Project') is a run of the river scheme located on New Bong Escape/Canal, 7 km downstream of Mangla Power Complex in District Mirpur, Azad State of Jammu & Kashmir. 2. The Project has been developed under auspices of PPIB/2002 Power Policy in the Private Sector by M/s Laraib Energy Limited with Hub Power Company-HUBCO as the Main Sponsor of the Project. 3. Out of total estimated Project cost of US$ 215 million; 75% has been financed by Asian Development Bank-ADB, Islamic Development Bank-IDB, IFC, Proparco, Habib Bank Limited-HBL & National Bank of Pakistan-NBP, whereas 25% has been invested by the Project Company as the Equity. 4. The Project Company achieved the Financial Close on 1st December 2009 and completed its construction through by M/s SAMBU/HUNDAI South Korea as the EPC Contractor. 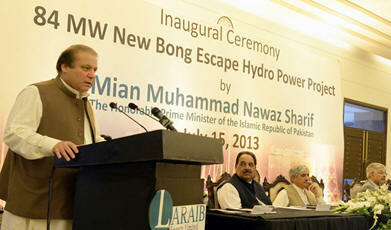 The Project was commissioned successfully on 23rd March 2013. The Project will be operated & maintained by Sponsors for 25 years, after which it will transferred to the Government at notional price of Re. 1 only. The Project has the ability to inject annually 470 GWh of clean, reliable and affordable electricity into the national grid. 5. 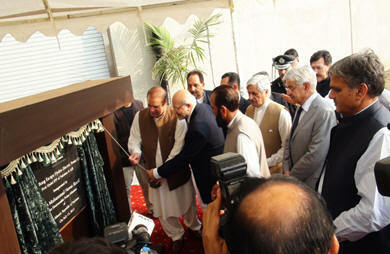 The Honourable Prime Minister of Pakistan, Mian Muahhamd Nawaz Sharif, inaugurated the 1st private sector hydropower project of Pakistan/AJ&K on 15th July 2013.